Renewal Farm needs your support to help more men like Frank. To donate, visit http://www.supportrenewalfarm.causevox.com. Frank is a strong man with piercing blue eyes. When he speaks, he speaks in short sentences. Straightforward, clear, and without any illusions. I ask him what brought him to the farm. What about your life now? He doesn’t finish his sentence. He just smiles. Frank has seen the radical change that Project Renewal can have on rehabilitation. And he’s not alone. 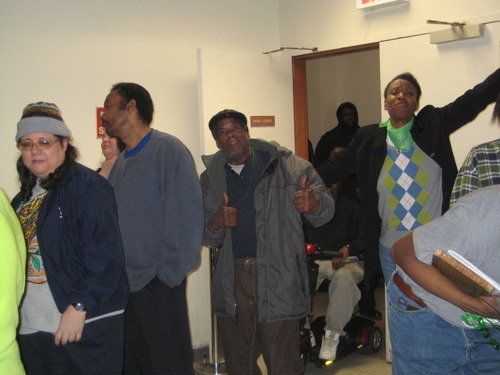 Men of all walks of life pass through Renewal Farm on their road to recovery and a new life. However, due to recent budget cuts, Renewal Farm is losing funding. It’s our hope that, through the Why are You Homeless? 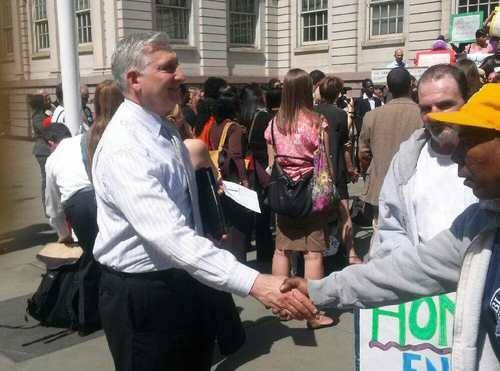 campaign, more New Yorkers will come to understand that anyone can become homeless. You can help support Project Renewal through donations. But we appreciate it just as much if you sign up to learn more about us or like us on Facebook. Check back next week for another eye-opening story about homelessness in the city. In the meantime, keep your eyes and hearts open. Renewal Farm needs your support to help more men like Tyler. To donate, visit http://www.supportrenewalfarm.causevox.com. To say that Tyler is not my idea of the typical homeless man is an understatement. It’s not his age or race so much as it is his demeanor. He’s refined, charming, articulate. He reminds me of one of my college buddies. I ask him what he’s doing here. “I grew up in Albany, went to college in Buffalo. That’s where I started doing drugs...I did well in school. Got into heroin over there. There’s a lot that comes through Toronto.” His eyes are squinting as he looks towards the sun. “I have high blood pressure for a 26-year-old...the blood pressure of a 90-year-old...I don’t know what.” This time when he laughs, his mouth opens all the way. It’s contagious. I laugh too. Tyler has seen the radical change the Project Renewal can have on rehabilitation. And he’s not alone. Men of all walks of life pass through Renewal Farm on their road to recovery and a new life. However, due to recent budget cuts, Renewal Farm is losing funding. It’s our hope that, through the "Why Are You Homeless?" 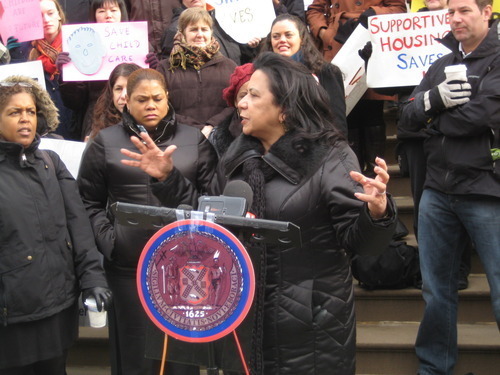 campaign, more New Yorkers will come to understand that anyone can become homeless. You can help support Project Renewal through donations. But we appreciate it just as much if you just sign up to learn more about us or like us on Facebook. Check back next week for another eye-opening story about homelessness in the city. In the meantime, keep your eyes and heart open. Renewal Farm needs your support to help more men like Fredly. To donate, visit http://www.supportrenewalfarm.causevox.com. Fredly is tall, well over six feet, and strong. His presence would be intimidating if it weren’t for his voice. He sounds more like a scholar than a homeless man. He’s watering the plants when I meet him. I come up and shake his hand. He starts to tell me about himself. He takes off his gloves and dusts them off. “Father’s an alcoholic, and he was pretty abusive. My household was secretive. Strict religious on the outside. But inside? Very chaotic, lot of shame and guilt. Lot of ignorance...Everything was always fear based. “I didn’t feel comfortable with my family,” he laughs. “I remember wishing I was adopted. I ask when things started to turn. I ask him if he ever tried to turn it around. I ask him about Project Renewal. He smiles. “This place taught me to love and respect myself. Lack of faith...this place kind of gives me hope, showed me that life is beyond material. There’s more to life. You can’t isolate yourself. When you isolate yourself, that’s where you go to the dark, dark, place. That’s where the disease starts. I ask him if he’s close to the guys in the program. “We’re all brothers. It creates an overwhelming experience. Sometimes you have brothers who love you more than you love yourself...they love you until you learn to love yourself. “Before, for me to have I fun, I used to think I just needed money, drugs, and women. I was lacking that spirituality...but when you start to feel it, that higher power, that spirituality, that love...you start to feel that you’re feeding your spirit. Fredly has seen the radical change Project Renewal can have on rehabilitation. And he’s not alone. 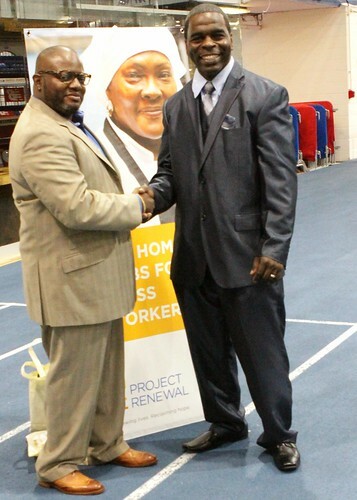 Men of all walks of life pass through the Renewal Farm on their road to recovery and a new life. However, due to recent budget cuts, Renewal Farm is losing funding. It’s our hope that, through the "Why are you Homeless" campaign, more New Yorkers will come to understand that anyone can become homeless. Mike stares down at the desk, gathering his thoughts. Then he raises his shaved head slightly and makes eye contact. His eyes return to the desk. His eyes shift from the desk to mine, then back again. What happened back in 2012? “Had a death in the family, got depressed. Got suspended from the union...I was between a rock and a hard place. I stayed at my grandma’s place, because she had just died. Stayed there for a year until the government came to repossess it. And what was life like after that? Why the shelter though. Do you have any family? Do they know you’re here? “I have an uncle I’m close with. He fixes cars. I help him, watch him. Clean up the tools. He knows my situation. He gave me an opportunity to come live with him, but I told him I’ll do it on my own. I’ll be alright.” A semblance of a one-sided smile forms on ‘alright.’ Then eyes back to the desk. I nod. It can get better. That’s what we’re trying to help with Project Renewal. There are tens of thousands of homeless people living in New York City. Many of them have stories just like his. It’s our hope that, through the Why Are You Homeless? 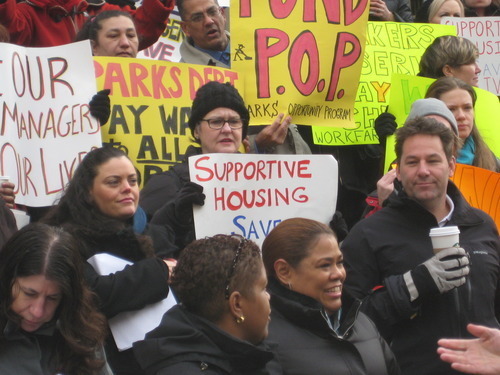 campaign, more New Yorkers will come to understand that anyone can become homeless. You can help people like Mike. Project Renewal runs, in part, on donations, but we appreciate it just as much if you just sign up to learn more about us or like us on Facebook. Check back next week for another eye-opening story about homelessness in the city. In the meantime, keep your eyes and heart open. Jamie has wide eyes and an other-worldly smile. He speaks slowly. “I’m not allowed to work, because I suffered an injury in my back, which is deteriorating. The bones never fused back together. I have osteoporosis in that area, 3 fractures in the lumbar region. They’re either going to put a plastic insert in or hope that my body doesn’t reject a cadaver donor...THEN I’LL BE ABLE TO WORK!” He nearly yells. He stares off into the distance with his mouth partially open. His face shifts. He turns back to me. How are you helping give back? You can help people like Steve. Project Renewal runs, in part, on donations, but we appreciate it just as much if you just sign up to learn more about us or like us on Facebook. Check back next week for another eye-opening story about homelessness in the city. In the meantime, keep your eyes and heart open. Steve’s eyes are tired but focused. He tells me to open the drawer next to me. Inside sits a collection of skilled pencil sketches. I pull out the top one. It’s a profile of a nameless superhero. I tell him it’s pretty good. “I was one of the first people of color to work for Marvel,” he says in a raspy voice. I look at the sketch again. You must have practiced a lot, I say. “I never practice, I just put my brain to paper,” he says. Steve is 83 years old, although I wouldn’t have put him a day over 60. In the first minute of our conversation, he runs through his life story like he’s checking boxes. I asked how he could be homeless with his background. “It’s a series of events...some too personal to mention.” His expression doesn’t change, but the subject does. I ask him about the shelter. “Homeless is at an all time high,” he continues. “We live in the greatest city...in the greatest country on earth, but there’s almost 60,000 homeless out there. It makes the the country look bad. It makes people not want to care...It used to be just people of color, now it’s everybody...you’ve got seniors out there like me, freezing to death. “But the trick is to work with the system, not against it. If you feel you’re being trampled on, use this.” He points to his head. 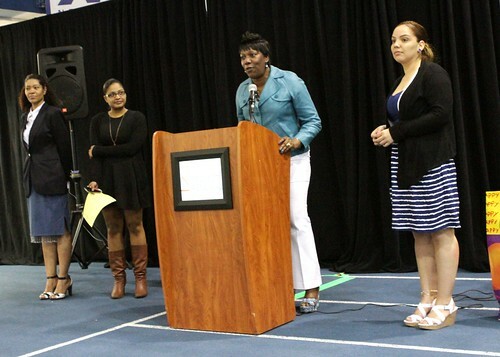 “You come into the shelter system with hopes to be self-sufficient. It doesn’t always happen that way...but I’ll be out of here by spring. The goal is moving forward–-meet with the right people. He collects himself. We’re silent for a few seconds. What are you doing in the meantime? “I’m doing art. If I’m not doing art, I’m reading.” He motions towards one of the posters he’s created for Project Renewal on the wall. Like Steve said, there are tens of thousands of homeless people living in New York City. Many of them have stories just like his. It’s our hope that, through the Why Are You Homeless? 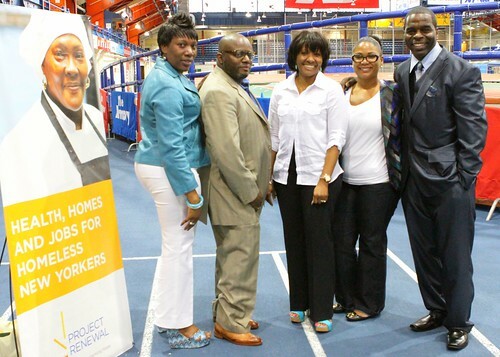 campaign, more New Yorkers will come to understand that anyone can become homeless. 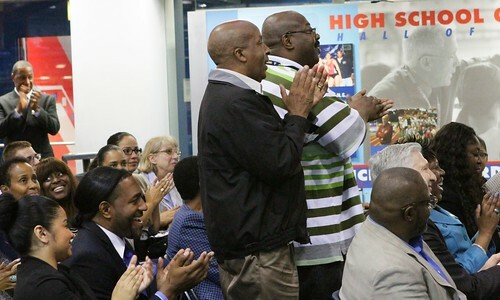 At Project Renewal, honoring Black History Month Takes on Many Forms. An Underground Railroad themed Papier-mâché community “quilt” assembled from individual panels created by staff and residents of Geffner House to celebrate Black History Month. Most of the people that Project Renewal serves are engaged in putting the pieces back together and moving on to renewed lives. It can entail daily--sometimes even hour by hour-- focus and struggle. Yet even so, staff and residents alike throughout our 16 sites and numerous programs are finding time and ways, this month, to honor, recognize, observe and celebrate black history. In some cases, like at Renewal House, our transitional housing program for men recovering from substance abuse, observance is a grassroots thing, initiated by the residents themselves. “We noticed that a lot of our people were very interested in it this year,” reports Renewal House Assistant Director Monica Diaz. In response, she hung posters and biographies of notable African Americans from Marcus Garvey to Malcolm X on the walls, and added black history as a running theme in the four group discussions staff and residents engage in each month. 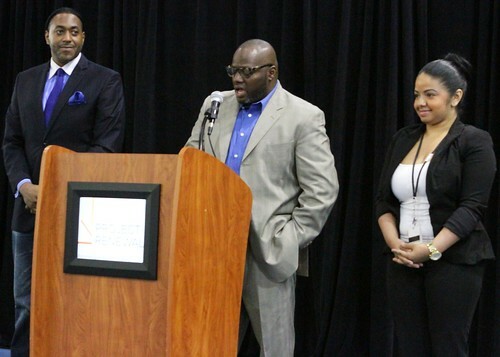 The most elaborate observance of Black History at Project Renewal this year has is in our 200-bed Fort Washington Men’s Shelter for men diagnosed with mental illness and/or substance abuse issues. Here, Recreation Therapist Joseph White has cooked up a month-long string of related activities and events, including special crossword puzzles, trivia matches, field trips and guest speakers, all centered on Black History Month and culminating in a grand, evening-long talent show featuring staff and resident actors, singers, and musicians, in performance. It is a tradition White has cultivated over the years. 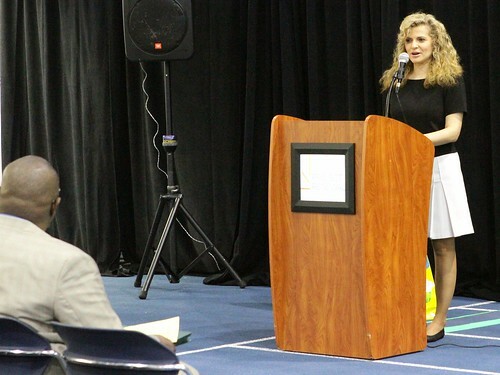 Likewise, when the Geffner House Recreation Director Ellis Eisner was first hired eight years ago, she decided to invite a guest speaker to the 20-story, 307-unit building for formerly homeless men and women. 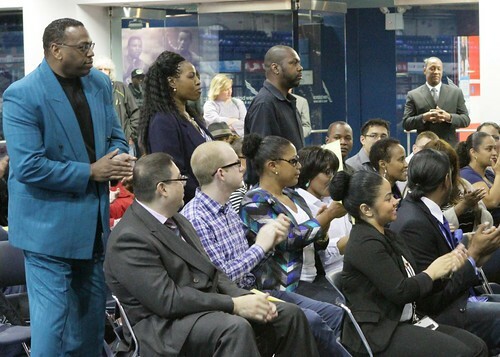 “I grew up during the movement,” confides Ellis who upholds this tradition February. “I was eight years old when they assassinated Martin Luther King. So this is an important holiday to me.” This month’s activities include a group day trip to Harlem’s Schomberg Center for Research in Black Culture, a visit from poetess/therapist Barbara Bethea, better known to her fans as the “Afrikana Madonna,” and, new this year, construction of a black-themed Papier-mâché community “quilt” assembled from individual panels created by staff and residents. In the depths of this winter’s brutal cold snap, a looming crisis: a homeless shelter in the Bronx is suddenly rendered uninhabitable due to broken water pipes. 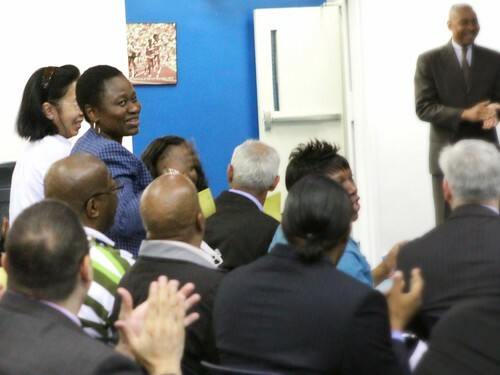 An emergency call from the NYC Department of Homeless Services (DHS) to Project Renewal’s new, state-of-the-art Bronx Boulevard Shelter provided the solution. “It was in the evening. I was on my way home after my shift when my cell phone rang,” recalls Ana Charle, Director of Bronx Boulevard. The shelter wasn’t yet fully open so Ana quickly scrambled to make sure that there were enough staff, goods and services in place to make her unanticipated visitors as comfortable as possible. Our staff pulled together that night, stepping outside their regular roles to help wherever needed - ensuring that the facility was clean and that sheets, blankets and toiletries were on hand. 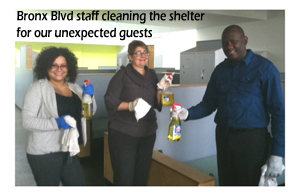 Although employees were called in to work unexpectedly, many volunteered to stay for 14 and 21 hour shifts to make certain that our guests’ needs were met! 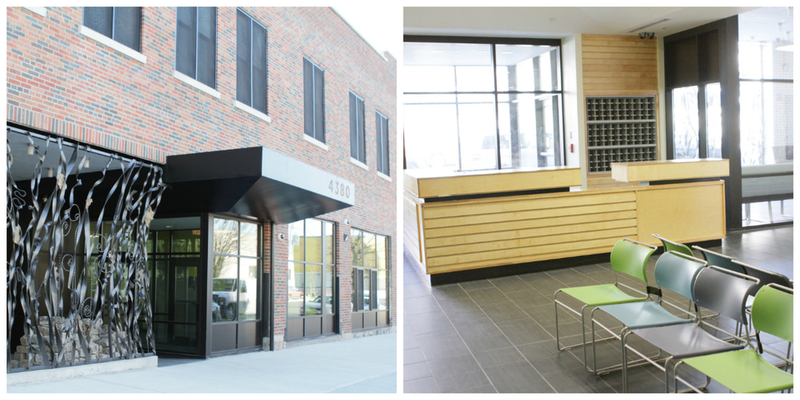 Click here to check out photos of our new Bronx Blvd shelter! Project Renewal Champions of HOPE. Our hats are off to Emily Brown, Elizabeth Fasanya, Shanira Griffith, Aluta Khanyile, Jackie Moore, Jana Pohorelsky, Mizraim Reyes, Rosalind Williams, and Brittany Zenner. These nine Project Renewal staffers volunteered to be DHS HOPE surveyors. So, on Monday, January 27th, they were out in the frigid night, traveling some of this city’s meaner avenues, looking for anyone living on the streets. As Emily Brown, who recruited our volunteers explains, DHS (NYC Department of Homeless Services) purposely chooses January to do the annual HOPE (Homeless Outreach Population Estimate) count, so that they can identify chronically homeless individuals, who tend to tough it out during the colder nights rather than use the shelter system. HOPE count data factors into how the city allocates resources. An undercount could result in an shortfall of services and/or facilities and supplies on hand. So we are proud of our PRI staffers who braved the chill themselves so that when vulnerable New Yorkers seek help in the future, they will not get left out in the cold. A huge thanks to you all, our Project Renewal Champions of HOPE! 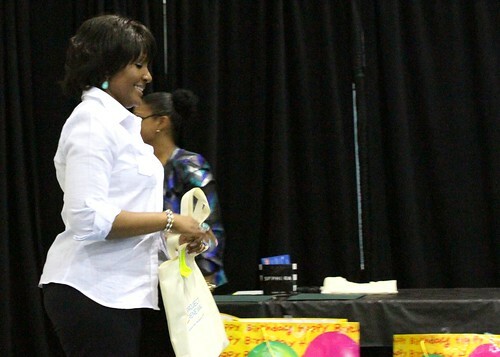 This year's annual anniversary celebration of the Ft. Washington Men's Shelter had a special guest--the new NYC Department of Homeless Services Commissioner Michele Ovesey. 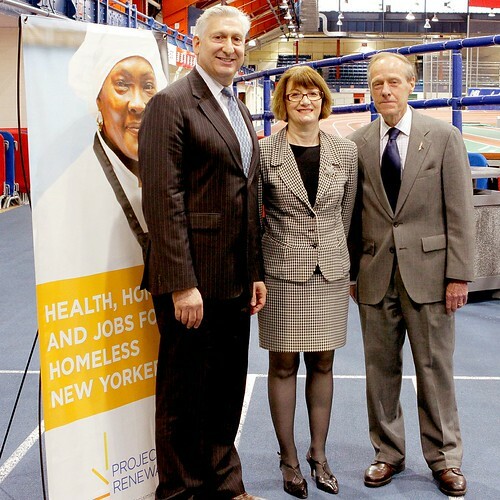 The New York City Department of Homeless Services (DHS) Commissioner Michele Ovesey (center) with Project Renewal President & CEO Mitchell Netburn (Left) and Dr. Norbert Sander, executive director of The Armory Foundation at The New Balance Track & Field Center. "I was amazed that Project Renewal was working on preventing homelessness and treating the underlying causes as early as 1967, a good 20 years before they were widely known." Congrats staff and clients on 17 years! Planters on “pop outs” hold trailing vines that will shade windows from western summer sun. As tenants settle in they are introduced to each other and have community meetings to talk about the skills they will be working on, including a cooking workshop to be held in the tenants’ apartments. You might have seen Harry as a homeless man on the train years ago. 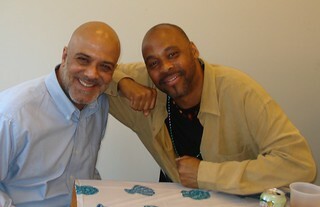 Since childhood he has lived on the streets and spent almost 30 years in prison during his life. But now Harry is back! 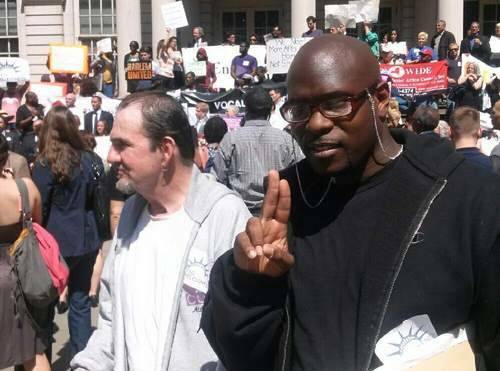 It is our honor to introduce you to Harry Dickerson, who gives us hope for New Yorkers still struggling to reclaim their lives. Watch his story and be inspired! 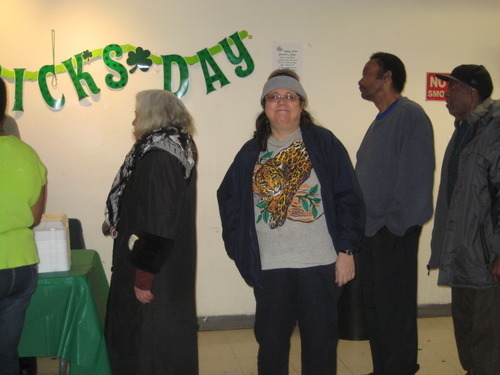 In February New York City’s Department of Homeless Services and hundreds of volunteers completed its annual point-in-time HOPE census of the unsheltered homeless population, first conducted in 2005. The report details changes in the count of unsheltered homeless men and women by borough, and identifies whether they are found living in the subway stations and trains underground or at street level. What does this mean for Project Renewal? At Project Renewal we focus on serving the hardest to reach homeless men and women—those with mental illness, drug addiction, or both. These clients are most often homeless without shelter (those represented by the HOPE Survey) or are among the 11,000 single adults living in emergency housing. 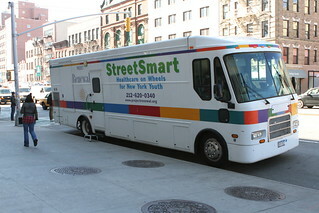 Four nights every week we partner with Manhattan Outreach Consortium to increase outreach to homeless men and women not in shelters by providing primary care through our medical vans. 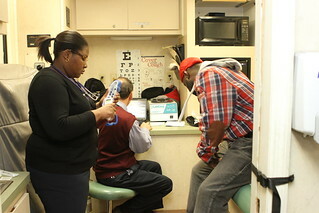 These mobile clinics bring healthcare to homeless men and women where they are, delivering primary care to those who are also struggling with mental illness and addiction. 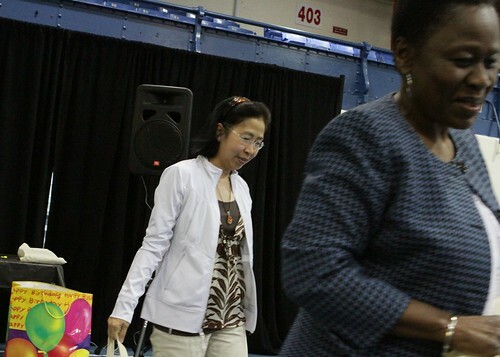 On those nights, healthcare providers seek out street homeless clients in places where they gather including behind the Port Authority Bus Terminal and the Harlem Y. The goal is to treat health needs before they escalate to emergency room visits and to encourage patients to seek ongoing care ideally in a residential treatment program. What can your gift do today? 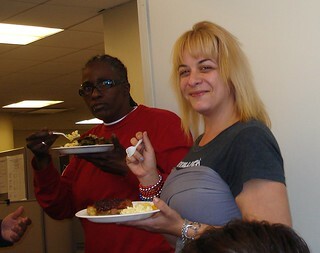 PSTP held a pot luck lunch on Wednesday April 25th so program staff and other Project Renewal Staff at Varick could mingle. It was a lunch filled with a lot of laughs, networking and plenty of good food. Everyone enjoyed the event. It was also an opportunity to say farewell to Garra Faber of S.T.E.P, and welcome our new employees. Homelessness can rob a person of their sense of independence and self-worth. But as the men and women we work with regain their health, self-sufficiency, and housing we empower them to become their own advocate. 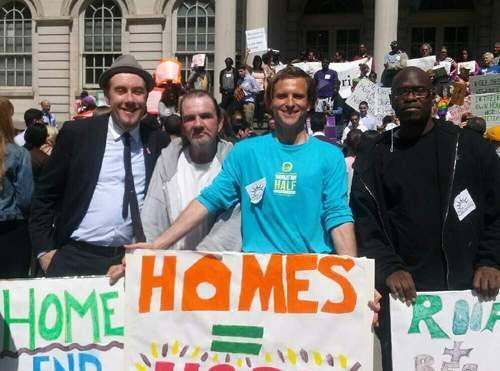 April 9th was a very good day; I and several clients went down to City Hall and joined with the United to End Homelessness campaign to speak about the importance of housing. The steps of City Hall were filled with various organizations that all came together for the same cause. 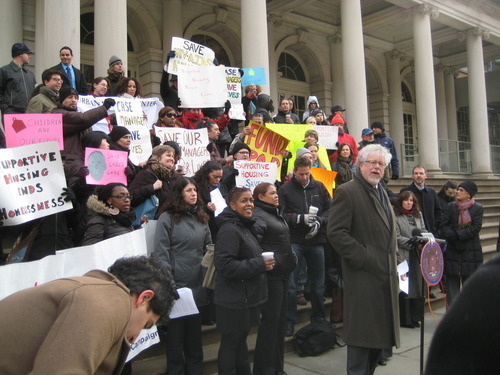 The Homeless United demonstration held on the steps of City Hall was an inspirational and uplifting event. 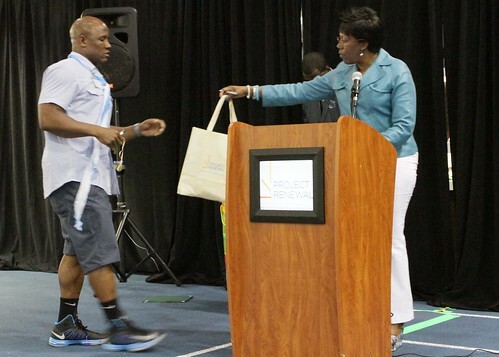 It was an event that stood for Hope and Fairness, an event that brought different organizations from all over the city together. In a united fashion, over two hundred strong, we stood. We stood and we were heard. THE STEPS OF CITY HALL WILL NEVER BE THE SAME. My experience at the demonstration was very fulfilling for myself and the benefit for others that are homeless. I feel like I’m a part of a revolution for the neglected. It was one of the most uplifting experiences I had in my life. I met very important people who gave me hope. The system works if you work the system. I’m looking forward to housing, and I’m also looking forward to participating in any other future events that support my cause. I felt like I was a part of something big. It was hot but I was happy to be here. It was an honor to be here, I felt like I helped my cause. I gained a sense of what it is like to be in a situation representing the public in a matter of importance to many people. It was a great day for the men. I always love when the clients feel like they’re a part of the solution and the world. 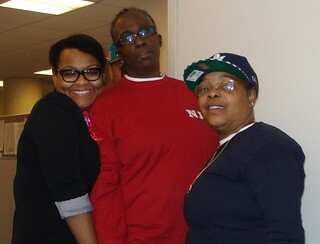 A special thank you to Ft. Washington Director Etta Graham for setting up and organizing the field trip for us. 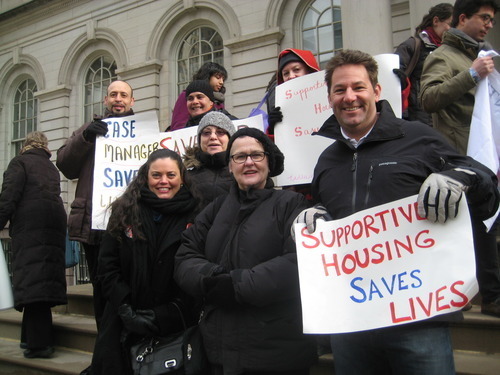 United to End Homelessness is a new coalition of advocates, homeless and formerly homeless individuals, service providers, faith leaders, and experts on the issue of homelessness in New York City. 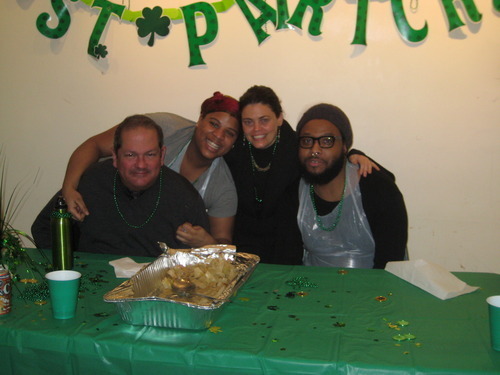 On the night of March 15th a party to celebrate St. Patrick’s Day took place at Geffner House. 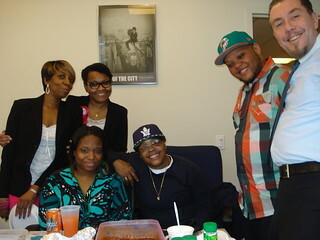 About 50 tenants attended and ate meals consisting of corned beef, cabbage and potatoes, and salad. A beautifully decorated and delicious sheet cake was for dessert. Boxed meals were brought to about 13 homebound tenants. Music of the Chieftains as well as soul, and R & B was played. A good time was had by all!